In this article, literature records of argasid and ixodid ticks feeding on humans worldwide are provided in view of increased awareness of risks associated with tick bites. Ticks can cause paralyses, toxicoses, allergic reactions and are vectors of a broad range of viral, rickettsial, bacterial and protozoan pathogens. Approximately 12 argasid species (Argas and Ornithodos) are frequently found attached to humans who intrude into tick-infested caves and burrows. Over 20 ixodid tick species are often found on humans exposed to infested vegetation: four of these are Amblyomma species, 7 Dermacentor spp., 3 Haemaphysalis spp., 2 Hyalomma spp. and 6 Ixodes species. Personal protection methods, such as repellents and acaricide-impregnated clothing are advised to minimize contact with infected ticks. Acaricidal control of ixodid ticks is impractical because of their wide distribution in forested areas, but houses infested with soft ticks can be sprayed with acaricidal formulations. Attached ticks should be removed without delay. The best way is to grasp the tick as close to the skin as possible with fine tweezers and pull firmly and steadily without twisting. 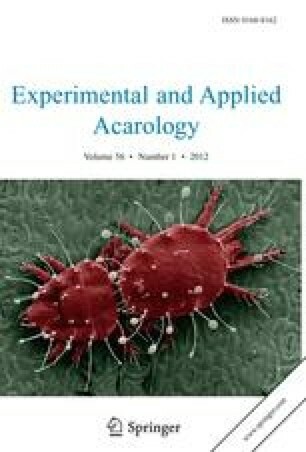 Finally, despite the fact that most people who are bitten destroy the offending tick in disgust, it is recommended that they preserve specimens in ethanol for taxonomic identification and detection of pathogens by molecular methods.